Local products at food co-ops around the country average 21% of total co-op sales, compared with a national grocery store average of just 1.8%. This cuts down on fossil fuel-burning trucks from delivering our food. Organic farming methods are more sustainable and have been identified as a key way to slow down climate change. 1 out of every 3 products sold at the food co-ops is organic. Did you know we hardly throw any food in the dumpster? In a year we donate about 24,000 pounds of edible nutritious food. The rest local farmers pick up for compost or animal feed. Food co-ops divert about twice as much food as similar-sized grocery stores. When you shop with a reusable bag at the co-op we donate to a local charity through our Beans for Bags program. This reusable bag incentive program has been a great success. In just a few short years since it’s inception it’s helped reduce the use of more than 100,000 single-use paper bags and has resulted in donations of more than $5,000 to local charities. Click here for more information about Beans for Bags. 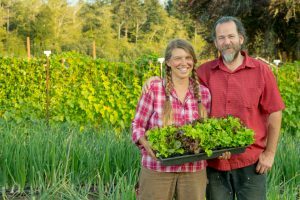 Food co-ops have been looking for ways to reduce impact for decades—many co-ops were formed by communities that wanted to buy food grown without synthetic chemicals and get dry goods like flour, oats and rice in bulk to reduce packaging waste. Read more about what our fellow co-ops are doing to reduce impact and benefit the environment. • Beans for Bags: Our reusable bag incentive program (started May 2015) has measured nearly 50,000 times in which shoppers have used a reusable tote. We donate the money we would have spent on paper bags to local non-profits. • Food Waste: Nothing goes in the dumpster! We donate anything that’s still edible to the Clatsop Community Action Regional Food Bank. 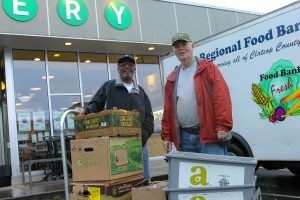 In a year we’ve donated more than 26,000 pounds of fresh food. Produce and deli scraps go to local farmers for compost or animal feed. Benefits include feeding hungry families and reducing waste from landfills prevents production of greenhouse gasses. • Lighting: We switched to all LED lights. They’re up to 80% more efficient, putting less demand on power plants and decreasing greenhouse gas emissions. Click here to see what our friends at some other Co-ops around the country are doing to make earth day every day too!